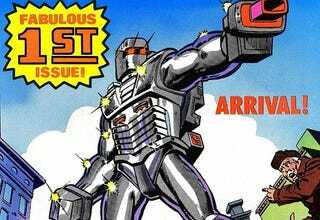 Rom and Micronauts Coming to IDW? So at San Diego Comic-Con, IDW announced via teaser image that they were going to be publishing new comic books for both Rom the Space Knight and Micronauts. Both Rom and Micronauts were toy properties that Marvel licensed in the ‘70s and ‘80s, giving both books to comic giant Bill Mantlo to write. Mantlo, in turn, took both properties and created rich mythologies for them and great characters. Interestingly enough, the Rom Spaceknight toy was a failure, while the book was a success. However, the name and likeness to Rom himself was owned by Parker Brothers and now Hasbro, who have resurrected the toy. The same thing happened with Micronauts, who were owned by Mego before they went under and were acquired by Hasbro in 2009. Hasbro’s other toy properties, G.I. Joe and Transformers, both have comics published by IDW and it was speculated that Rom and Micronauts would soon follow. This presents an interesting conundrum: Marvel cannot publish anything with Rom or the Micronauts, since they do not own their names or likeness. But, at the same time, Mantlo and Marvel created most of the things around them — Rom’s homeworld of Galadar, the entire line of other Spaceknights, the Dire Wraiths, the Microverse, the Enigma Force, pretty much everything aside from the main characters themselves. So IDW can’t publish anything using them, only the characters they have the rights. But here’s another thing: IDW has a deal with Marvel and DC to publish Artist’s Editions of some of their properties. They’ve done Walter Simonson’s Thor, John Byrne’s Fantastic Four, and even David Mazzucchelli’s Daredevil: Born Again. So could, in fact, Marvel ask for Rom and Micronauts books to be printed by IDW? After all, IDW has the rights to the characters, Marvel has the rights to everything else.